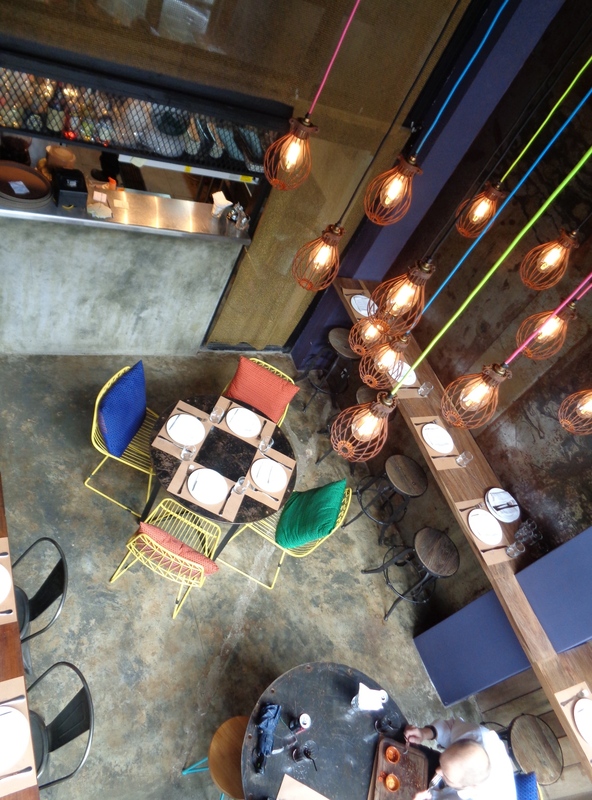 The newly opened TinTin is self styled as a home-made Mexican street food and tequila bar and there’s no doubt that it serves up great Mexican grub in hipster-happy surrounds. As to be expected from a 57 Below venture – the investment company that brought Yangonites the delights of Union Bar, two Parami Pizza branches and Gekko (the latter of which TinTin is most similar to architecturally) – the décor is top notch. Industrial styled light bulbs suspended from colourful rods give off a warm glow, while the ‘pipeline’ lights keep it cozy upstairs. The view of the glass panelled kitchen below is softened by sheets of metal armoury and the rustic wooden tables and the cheerily coloured seats and cushions achieve a relaxed sense of style. Place mats are made of sheets of brown paper with the odd stamp sporting the restaurant’s name. Perhaps needless to say, the only music lyrics you’ll hear will be in Spanish and the tempo upbeat. 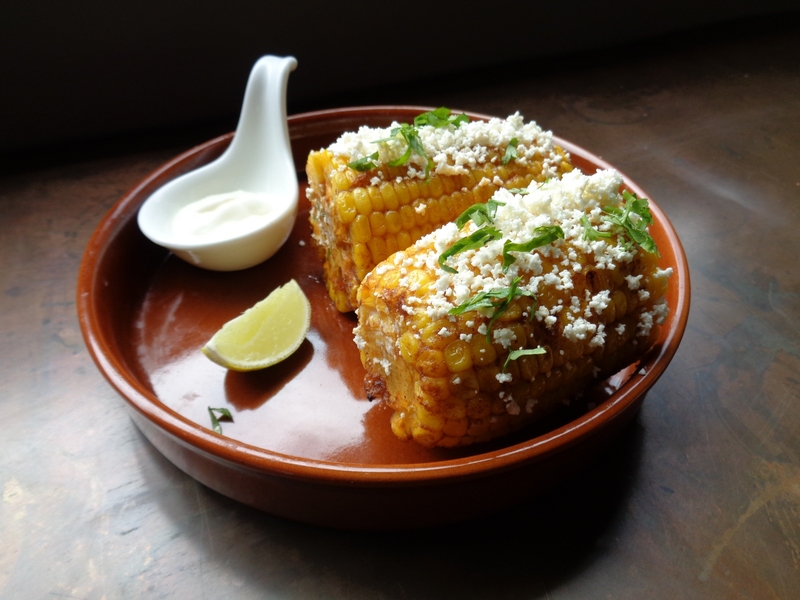 Street food in Mexico is called antojitos (literally “little cravings”) because it is comprised of foods that are typically not eaten during the main meal of the day – corn is one such example. 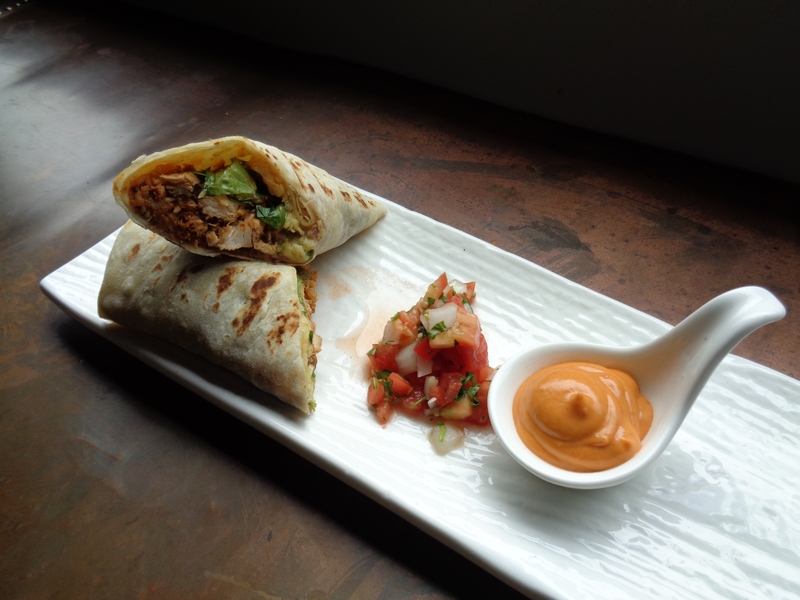 Mexico is widely regarded as having the most extensive variety of street food in Latin America – if not the world. UNESCO respects the cuisine enough to have labelled it an intangible cultural heritage of mankind. Having sampled other Mexican offerings in Yangon – some of which are stranger than others – I’d say that TinTin most definitely takes the cake for authenticity. Full credit to TinTin’s Chef Jorge Bernal, who hails from Mexico City , along with what must surely be his tightly run ship. I ordered the burrito compadre (US$9), which comprises chorizo chicken, rice, pico de gallo (better known as salsa) and comes with a spoonful of deliciously spicy chipotle mayo. It was filling enough in itself – particularly for lunch, though I didn’t see any reason to stop there. The elotes (a.k.a. corn on the cob) was served with sour cream, two chunks of lime and sprinkled with cilantro (a.k.a. coriander). The mess it leaves on fingers and between the teeth doesn’t make it an ideal date dish – though it’s nothing a quick trip to the bathroom can’t fix. I was seated upstairs and headed to what I thought was the toilet. I saw a ‘staff only’ sign and a set of stairs leading to what looked like a back room, so I backed off and headed down the other set of stairs leading to the entrance. I felt a bit silly when I was then told by one of the smartly dressed staff that the first stairs I’d seen do in fact lead to the toilet (this is a rather long way of saying that a toilet sign would be useful). The stairs to the toilets are steep and the lighting dim – I wouldn’t recommend taking them on after a few tequilas. And speaking of tequilas – there’s no shortage of ‘em at TinTin. There’s even a coffee flavoured variety for $8, while the costliest (and no doubt loveliest) is the seven-year-old Fuentesca at a whopping $19 a shot. There’s also a host of mezcals on offer, which a Google search defined as a spirit made from the heart of the cactus-like agave plant (and is not be confused with the psychoactive, mescaline producing peyote). Cocktails range from $5 to $8 and include an intriguing ‘beer on the rocks’ with a michelada mix, lime juice, chili and salt. The use of Spanish throughout TinTin’s menu is a little intimidating if you don’t speak an iota of the language. Substituting a bit more English would better whet a less cultured appetite such as my own, as my ignorance meant I had to automatically exclude ordering several items. Friends had warned me that TinTin is pricey. Even the guacamole costs US$5 – and on top of everything ordered is a 10 percent service charge and a 5 percent government charge. Lord knows how expensive it is to run a restaurant in Yangon, but being charged US$7 for a bottle of water and US$4 for a cob of corn that costs K250 (for two!) at the supermarket – even with the delicious condiments on top – didn’t feel like the best value in town. And that says something, as this town isn’t known for being good value. A word of warning: TinTin is small and popular. Do not, as I did, turn up on a Saturday night without a booking, as you’ll likely be turned away or asked to return for the second sitting at 8pm. I’m certainly glad I didn’t give up after my first attempt to have a bite of Mexican in Yangon a la TinTin style. Dr Thant Thaw Kaung is the CEO of Myanmar Book Centre Co., Ltd and has more than two decades of experience in Myanmar’s book trade. He talks to Mizzima Weekly’s Jessica Mudditt about the problems facing the industry and why he remains optimistic about its future. Until strict censorship laws were abolished in 2012, every title imported to Myanmar required the approval of the Press Scrutiny and Registration Division. Many were banned, such as the biographies of Nelson Mandela, the Dalai Lama – and of course, Daw Aung San Suu Kyi. Are book sales benefitting from a new era of liberalisation? Certainly – sales are on the up. When my wife and I started our business in 1995, censorship was extremely strict, so we were so happy when the situation changed and we no longer had to obtain permission to import every single title. Nowadays, political works which wouldn’t have seen the light of day are best sellers. There’s been an emergence of new writers, particularly in the Myanmar language, and many are the memoirs of former political prisoners. Ma Thangei and Ma Thida come to mind – and they’re very talented writers. Just last night I read an excellent book in Myanmar by Kyaw Zwa Moe, the editor of The Irrawaddy, which is titled You Need to Apologise to the People. He recounts a wide range of fascinating interviews he carried out – including an unnamed person who attempted to assassinate the former head of Military Intelligence, Khin Nyunt, as well as monks who were imprisoned for many, many years. I hope it will be translated so that English readers can also enjoy it. Do you feel that writers practice self-censorship in any way? No, I don’t. In fact what I would say is that things are completely different now than they were before 2010, but of course, not everyone is completely satisfied with the speed of progress. I think that some people may be expecting too much too soon, and that change needs to be gradual –Myanmar will eventually become fully democratic. Some feel that after living under oppression for so many years, now is the time to speak up – whenever they like, and sometimes in an extreme way. It’s usually in the form of personal attacks or hate speech – the former of which I read in the media and the latter, on Facebook. I think it’s a very big problem, but it’s not one I’ve found in books. 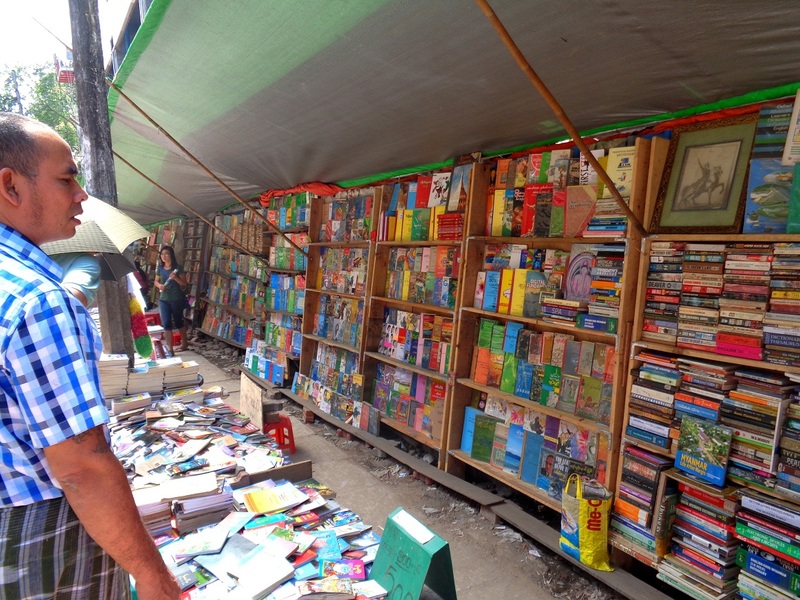 What types of books dominate Myanmar’s book trade? If you think of it as a pie chart, books on English Language Teaching (ELT) take the biggest chunk. Myanmar Book Centre is the official representatives of the ‘Big Four’ – Oxford University Press, MacMillan, Pearson and Sage, the titles of which we print locally. Second to that are education titles for basic and higher education – it’s quite big business here. The reason why is because there is a huge appetite to learn English – just look at the British Council, which is always full. Our society’s aptitude for English is generational – those who are over 70 speak excellent English as many attended convent or missionary schools, while those born following 1960 lived in Ne Win’s era and cannot speak English well because the language was deliberately suppressed and everything was Burmanised. The young generation – and their parents – understand the value of learning English. But the problem is that there is a lack of skilled teachers in public schools, as they come from the previous generation. It’s a big problem, but the benefits of the government’s new policy towards the teaching of English will be seen in four or five years. Another genre that’s doing very well are English language books that relate to Myanmar – whether it be guide books, historical fiction or biographies, as well as the political works as I mentioned. This is largely driven by the recent influx of tourists. Is there are a shortage of quality translators as a result of past education policies? Yes, there is most definitely a shortage of translators, which means that many talented Myanmar writers are unknown in the West, while many contemporary classics are inaccessible to Myanmar readers. There are so few reputable translators that they are overloaded and we sometimes have to wait a few months before they can take on a project. There are also some inherent difficulties in translating Myanmar to English – the languages are totally different. Translating from Myanmar to English is more difficult, because the translator must be very good at English and be highly familiar with the subject matter. Many translators write well in English, but often their style is more like news reporting than literary. Since setting up a publishing wing five years ago, Myanmar Book Centre has published ten books translated into Myanmar, including Dr Thant Myint U’s River of Lost Footsteps and Where China Meets India. We’re selective about the books we choose – only titles which will work here in Myanmar in that they speak to a local audience. It’s a huge problem – particularly for us, as our main line of business is in imports and distribution. In Myanmar, only books published which are published locally are protected by the Copyright Law of 1914. These pirate guys are clever – they don’t bother pirating local language books because they know it’s against the law – plus the prices of such books are so cheap that it wouldn’t be profitable. I heard recently of a local publisher who published a map that was pirated by a foreign company. The local publisher tried to sue the company but he couldn’t – they simply ignored him because they know there’s no legal remedy. Piracy is divided into two sectors – the first is books on Myanmar aimed at the tourist market, and the other is English Language Teaching (ELT) and education books. As I mentioned, education is a big industry, so our business really suffers. We’re literally losing money every day. There’s a guy who owns his own shop and comes to Myanmar Book Centre on a daily basis to buy single copies of our best-selling education books. Then, about two weeks later, we see those titles being sold for 20 percent less than ours. There are a number of people doing this – I know them well but we can’t take action against them because there’s no law against it. It’s terrible. Could you not refuse to sell books to this person? There’s no point – it would be too easy for him to just send someone else and I can’t refuse a customer. With so much undermining the profitability of your business, how does Myanmar Book Centre manage to retain its viability? We’ve developed close relationships with many private and international schools, such as Yangon International School and Myanmar International School. These institutions strongly support original books, so we import books on their behalf. We also work hard to provide excellent customer service at the retail level, such as by providing catalogues and free samples. I’d also say that the mentality towards piracy is changing – of course there are still those who just want cheap books – but many now want quality. Fortunately there is a growing middle class who feel this way. We also work hard to offer the most reasonable prices we can. In this regard we’re very lucky, because as we’ve been in the book trade for many years, we’re fully supported by international publishers and they provide us with good discounts. We also source a lot of books from India as the prices there are very reasonable prices – we work with over 50 different publishers in India. Are you confident that if the Intellectual Property Law is passed, it will put an end to piracy in Myanmar’s book trade? I’m very confident in the draft law because it really supports investors and importers. It will be drive our local publishing industry to new heights and it’s expected to come into effect in 2016. I have given input into the draft during regular meetings with a committee which is led by the Ministry of Science and Technology, which is involved in design and trademark aspects. The Ministry of Information is handling the copyright side. Do you think there will be any practical challenges in terms of the law actually being enforced? Well, it will of course be the responsibility of the government to enforce it. But luckily for our industry, the pirating of books is done by small-scale players who own shops downtown. This is unlike the pirating of music, which is done on a mass scale and is linked to members of the military. But when the law is passed, we will have to take action, whether we like it or not, because we are the official representative of various publishers and they will pressure us to do so. Many of the people involved in piracy are my friends – I’ve already spoken to Bagan Book House to ask them to reduce the number of pirated books. I offered to supply them with our imported books to avoid prosecution. However they didn’t really listen to me, because the law isn’t yet in force. Are local writers and publishers familiar with contractual rights? In general, knowledge is very low on both sides. My authors, such as Dr Thant Myint-U don’t need anything explained to them – in fact he himself secured personal copyright for each of his books, which was a very clever move. But in the majority of cases, authors simply trust their publishers and don’t even discuss who will own the copyright – so the publisher takes everything. Nor are digital rights discussed, though they should be, because eventually e-versions will appear and the rights to them should belong to the author. 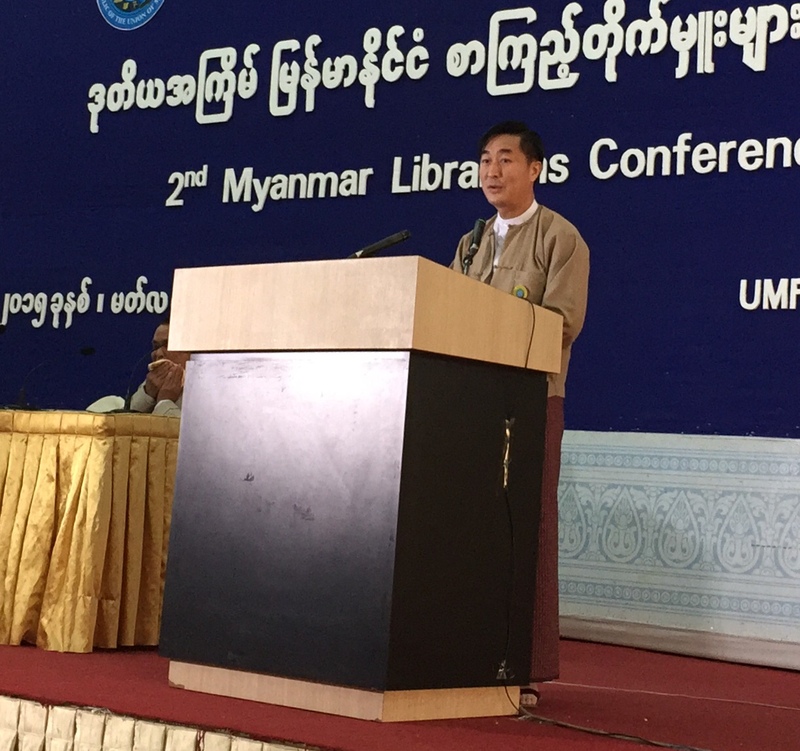 Is Myanmar ready for an e-book market? It’s not the right time to introduce e-version of books. This is because they are already available online, free of charge. As soon as a book becomes popular or famous it is scanned and appears on one of a variety of sites in the Myanmar language. No one can take action against this, so as a business model it wouldn’t be viable. The people who are uploading scanned books aren’t doing it to make money and they don’t see any problem with ‘sharing’ free content – so a lot of education is needed to change such attitudes. The maximum number of copies of any single title published is just 1,000 because there is no demand, no market for more when a book can be downloaded for free. As a result, the writers are dying and the publishers are bleeding a lot. We cannot survive if it continues.